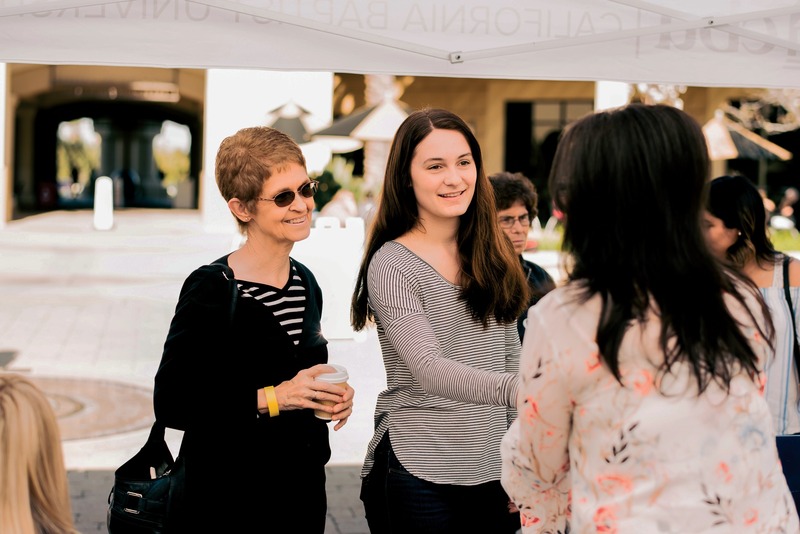 The campus is buzzing with excitement as California Baptist University students and staff prepare for one of the most beloved school events of the semester — Grandparents Day — occurring April 11. Grandparents Day is an event in which students invite their grandparents to come to campus to show them their college life. This will be the seventh year CBU will host the event since its debut in 2013. The day is packed with fun-filled activities and the program allows grandparents to choose what special events they would like to attend. However, the primary focus is for grandparents to spend time with their CBU grandchild. This year’s event will have a variety of activities from which to choose. The morning of Grandparents Day, will feature a Welcome Session to start off the day and show grandparents what is in store for them. Then, they can attend Chapel with their grandchild afterward and get lunch at one of the many CBU dining locations. Throughout the day they can take tours, visit the academic buildings and peruse the living areas. Bre’Anna Bush, sophomore kinesiology major, said performing on grandparents is an honor because they hold a special place in her heart and she is excited to perform again for them this year. “Being a part of Women’s Choir gave me the opportunity to perform in front of some grandparents last year. It was so much fun doing that. It was a huge blessing and joy to see the smiles that were put on their faces as we sang, some even surprised by singing along, which made the experience even better for everyone involved,” Bush said. What is special about this day is grandparents do not have to show up early or attend every session. The day is designed to have many opportunities and they can drop in wherever they like, especially if they are visiting from afar. Toward the end of the day, grandparents have free time with their student. They are able to visit the CBU Campus Store, where they are offered 10 percent off items. Josh Moss, director of Alumni and Parent Relations, said the whole reason for Grandparents Day is to give the grandparents a glimpse of their grandchild’s new life. Even though the event is named Grandparents Day, other family members are still invited to attend. Over the years, parents, aunts, uncles and sometimes even great-grandparents have tagged along for the ride. This day can help grandparents experience college life all over again. For some, Grandparents Day is a perfect opportuniy for grandparents who were not able to attend college to see what it would be like with their grandchild by their side. Emily Anderson, senior actuarial science major, attended Grandparents Day in the past with her grandma, who she said is a constant support in her life and is planning on attending this year, as well. According to the Office of Alumni and Parent Relations, 250 to 300 grandparents in total have attended Grandparent’s Day over the years. Moss said they want students to honor the grandparents who have been supportive in their lives. Bush also said it is a great opportunity for grandparents to see the beautiful campus that is CBU. “Grandparents Day allows grandparents to witness the talent, diversity, creativity, drive and Christ-like love that is represented throughout the CBU student body,” Bush said. Grandparents Day is a good opportunity to reconnect grandparents and their grandchild and participate in some fun activities provided by CBU and its faculty that will be memorable.